Chopped and shaped chicken breast in a southern fried gluten free crumb coating. 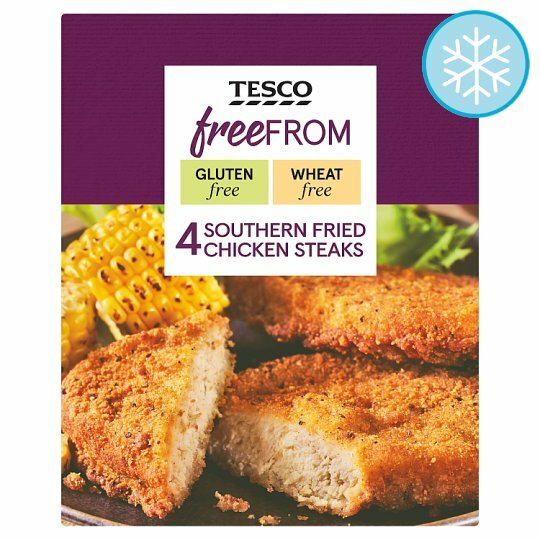 These wheat & gluten free chicken steaks are a tasty teatime favourite and great for the whole family. Fuss free, quick cooking straight from the freezer. Made with 100% tender chicken breast and coated in gluten free, southern fried breadcrumbs. Cook from frozen in just 32 minutes and make a midweek meal with Free From white rolls, fresh salad leaves, and coleslaw. Treat yourself after dinner with our Free From desserts and cakes. This product is made with 100% chicken breast and produced in the UK with no artificial flavours, colours or preservatives. INGREDIENTS: Chicken Breast (63%), Water, Rapeseed Oil, Gram Flour, Rice Flour, Maize Starch, Maize Flour, Potato Starch, Salt, Spices, Pea Starch, Yeast Powder, Onion Powder, Dextrose, Pea Fibre, Maltodextrin, Garlic Powder, Flavouring, Sunflower Oil. Always wash hands, surfaces and untensils thoroughly after contact with raw meat.